Today I received a blog award from Primoeza. Thanks Primoeza! Not only for this sweet gesture, but also for inspiring and encouraging me to start this blog. I am a huge fan of your work and blog, and couldn't have done this without you..ok, now onto the questions! 1. Why did you create the blog? Good question! People have been telling me to do it for a while now(very nice of them!). I thought it would be a more fun and inspirational use of my internet time than Jdate or Match.com (NOT that those sites don't inspire me, but that's a whole other post). Plus, now that I have a blog, I have a good excuse to get a camera! 2. What kind of blogs do you follow? I love any blog that tells me where I need to eat next (must find out about Michael White's newest restaurant before the masses! have to know about $1 oyster specials!). I love Fresh. Their products are amazing. And that packaging! It's all so light and airy! oh J Crew...your shiny baubles and sequins and deliciously colored Cashmere sweaters...and your sale rack of dreams! 5. Your indispensable makeup product? Eh, I don't have any product I couldn't live without. I've been searching for the perfect scent for YEARS now, and I finally found one I love at Anthropologie. It's Royal Apothic (Courts of Venice scent), and BOY does it smell good! Love their packaging too. And might I add that it was very reasonably priced? Would I alienate a good number of the very few readers I currently have if I said "the Notebook"? Because let's say for instance I DID love "The Notebook" more than any other movie in the whole wide world, not that I do...Would that be a bad thing? Could you blame a girl for being swept up in the magic of Ryan Gosling? Could you?? I mean, how hot is that moment when he grabs Rachel McAdams in the pouring rain, and tells her "it STILL isn't over!! "?...but uh, back to my favorite movie...It's actually something more socially acceptable (but also with Ryan Gosling): "Lars and the Real Girl". 9. What country would you like to visit and why? Greece! If it's anything like it looks in the movies, I need to go there NOW! That bright blue water! Oh, and the food....I can only imagine how delicious the food is there. 10. Make the last question and answer to yourself: What makes you laugh out loud? I know someone who actually slipped on a banana peel in real life(this was 12 years ago at this point)! It doesn't matter how many times I think of this, it ALWAYS gives me a good laugh! I thought that only happened in the cartoons! Now I am supposed to pass this award on to 10 blogs I love, but I am new to the community and don't know that many bloggers yet.. Instead, I will choose one person who is like 10 people in one (talented knitter, painter, textile designer, comedienne etc): my friend and coworker, Knit Darling. LOL! sorry, i know we all hate that abbreviation, but you are funny. haha, THANKS LIZ! if anyone can make LOL sound cool, it's you! 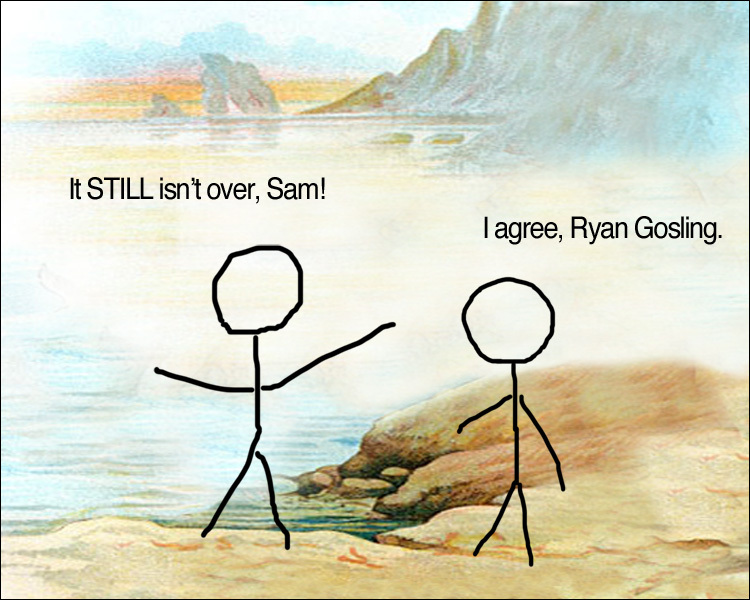 I just scrolled down and saw your Ryan Gosling stick figure pic and am still laughing!! IT STEEL EESN'T OVAH! Why does he say it like that in my head? I may be remembering it wrong. Haha yes, you're right Mar! 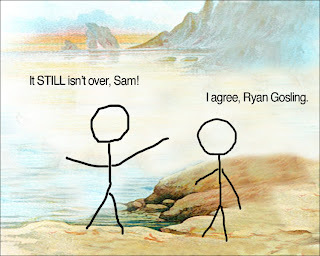 He does say it like that in the movie...but this is a stick figure interpretation of Ryan, so he is a bit more calm, cool and collected. For the record, most people can't believe I actually slipped on a banana peel...I still laugh out loud too when I think of that. I just remember you convulsively laughing at me hardly able to breath while I tried to figure out what had happened! Haha, you are so funny, Anonymous! Actually I wasn't there for the actual incident but feel like I was, considering all the times I've told the story!